The problem with most inexpensive diving watches is you really don’t know if they are going to live up to their promises, unless they are the Orient Diving Sports automatic M-Force mens watches. An Orient M-Force is always a strong choice when it comes to practicality and luxury, for it covers both without compromising on either. 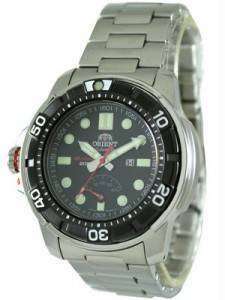 Costing a little extra than other dive options from Orient, the M-Force diving sports automatic watches are more sophisticated in their technicalities and more interesting when it comes to the designs and features. However, it is more for the quality components and ISO certifications that M-Force developed a worldwide following; else, you get a lot of other crappy options at the same price range. Another thing that requires a special mention is the M-Force’s aesthetics. Be it the Beast or the Saturation Diver, you don’t need to be a huge Orient fan to fall for these watches. It’s been almost 20 years the M-FORCE is around but the current ones are hugely different from their 1997 predecessors. The new ones sport an entirely new mechanical movement and their mechanical force image got reinforced readily. A mechanical watch that expresses forcefulness, they inherit the concepts of their predecessors and are smarter and more rugged this time. Their special structure absorbs any shock the watch is exposed to, making them ideal choices both under the water and on the land. M-FORCE is all about superb designs, high functionalities, high-quality materials and masterful craftsmanship; now that the brand also embraced Titanium, things turned better within no time. Like other M-Force models, the Orient Divers Sports Automatic M-Force also features an ISO-standard water resistance (200 meters) and special shock-absorbing structure, which makes it ideal for scuba diving. Titanium being very light, it enhances the wearability of the watch dramatically. Firstly, Titanium is up to 5 times lighter than steel, which puts the minimum amount of resistance under water. Next, Titanium’s high resistance to corrosion ensures your watch is not going to die anytime soon. For the bezel; however, stainless steel proves better due to its higher scratch resistance property than titanium. It’s also cheaper than titanium, so the voluminous design also comes cheap. Together, the metals create something that’s both lightweight and strong. If you find the Orient M-Force Air Diver Automatic Men’s Watch a bit too much to handle, a safer choice would be the M-Force Beast. This one is Orient’s next most-serious dive-watch option. The in-house movement of the Beast is more sophisticated (22-jewel, caliber 40N5A, 21,600 beats/hour; features date, power reserve, manual winding and hacking) than what they use in their usual dive watches and this one too comes with an ISO 6425 certification. The diving community addresses the M-Force Beast as a diver’s dive watch.